What are you going to use for your ring pillow? Don't want traditional white? 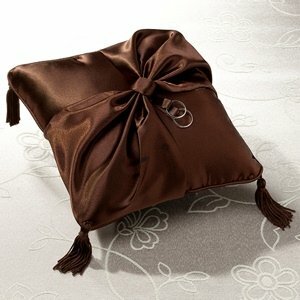 If you'd like something with color, but not too over the top, consider this lovely brown satin ring bearer pillow. Measuring 7.5" wide, this ring pillow is covered in brown satin. The front is decorated with a brown satin ribbon tied together with a diamond band ornament. It holds two silver rings in the center so you can hand over the real rings to the Best Man for safekeeping. It's just the right touch of color, but not too much. Coordinates with satin bow purse, garter, flower girl basket, and guest book and pen set for a complete look (search for Brown Satin). Perfect for a brown wedding theme.